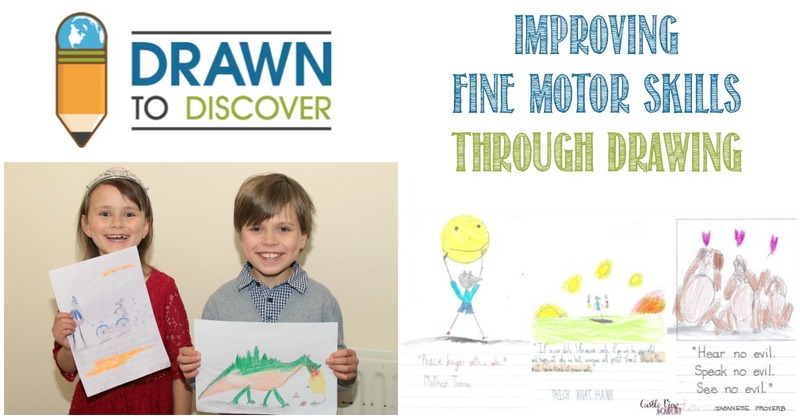 Drawn To Discover is a drawing program aimed at children aged four to eleven and there are currently three courses available: Drawing Cursive, Drawn To Peace, and Level 1: Drawn to Connections. 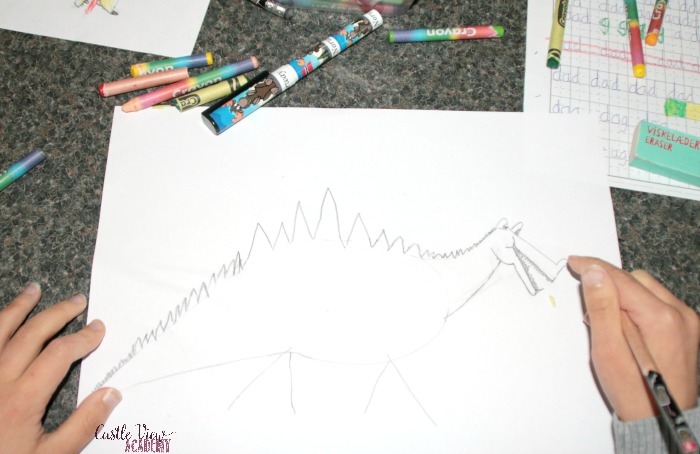 The goal of these courses is for children to improve their fine motor skills while also increasing their creativity and learning drawing techniques. 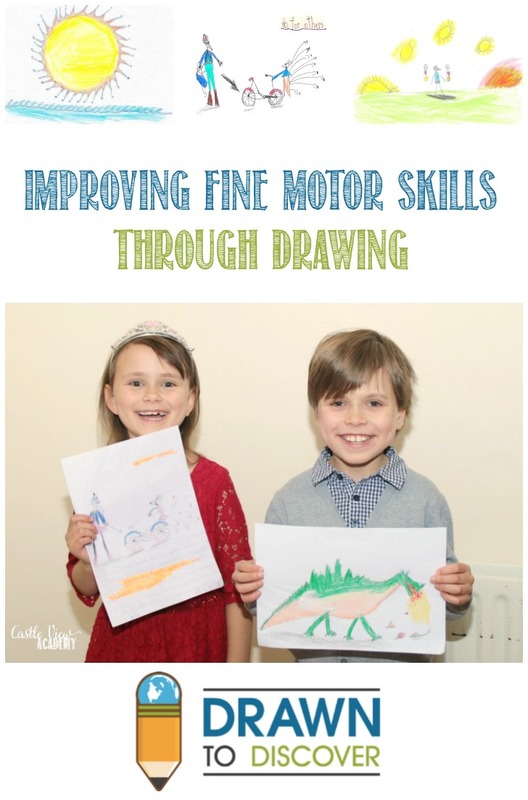 Why are fine motor skills so important? It isn’t only to have tidy penmanship, although that is also a great skill to have. Research has found a link between fine motor skills, language development, reading, creativity, and critical thinking. It’s upon this research that Drawn To Discover is based. The course lessons consist of one or two video lessons presented by Wendy Anderson Halperin. Each lesson has links to specific papers that can be downloaded and printed for each lesson if needed; but you may find that you have similar paper already on hand. Other than that, all you will need are some crayons to get started. 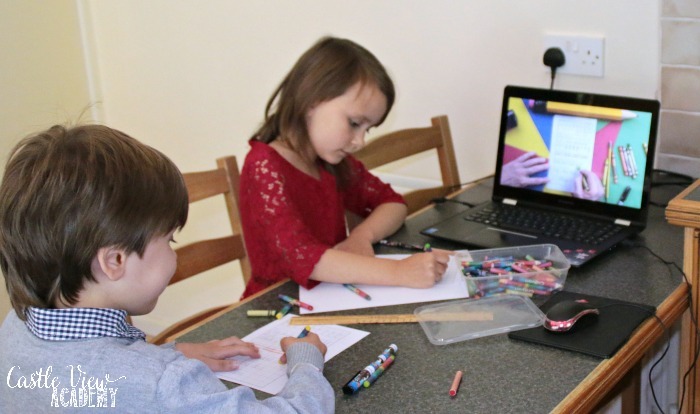 At about thirty minutes total for the videos the classes are a good length; although by the time my children stop the video to draw each element before starting it again, it does take them more time to complete a lesson. After each lesson is done there is a “complete” button to press so you can earn points and watch your progress through each of the courses. 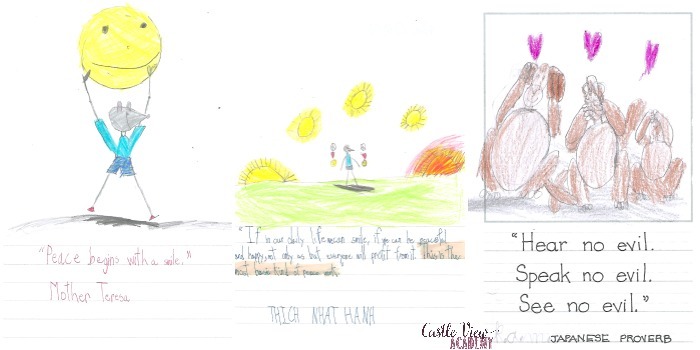 Drawn To Peace was the course that first caught my attention as we’re currently living in Northern Ireland and I want my children to grow up to be a part of the peace process, not part of the aggravation. Both of my children found this course to be their favourite, as well. There are sixty lessons in this course, with most of them concentrating on short quotes from famous peace activists such as Gandhi, Buddha, and Mother Theresa, as well Japanese proverbs and many more. The quote or phrase is on the bottom half of the paper and then Wendy teaches the children to draw a picture to go along with it. While she does this in a step-by-step fashion, she also talks more about what peace means and how children can learn to be more peaceful for a better world. This course has the most commentary within it. 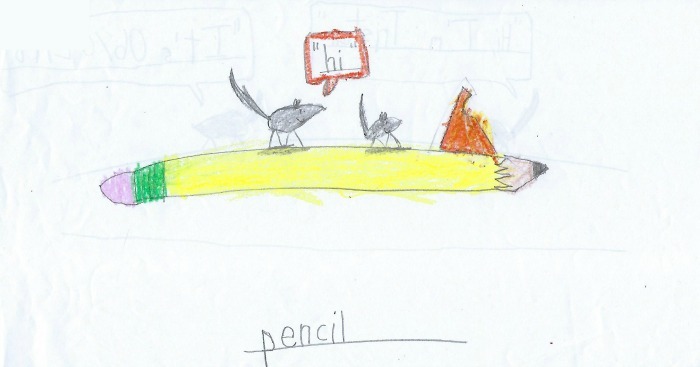 Cute little stick-figured mice are the featured characters in the pictures that accompany each of the phrases. READ Simplify Your Dinners & Fill Your Freezer! Drawing Cursive gives a fun spin on dry handwriting practice. 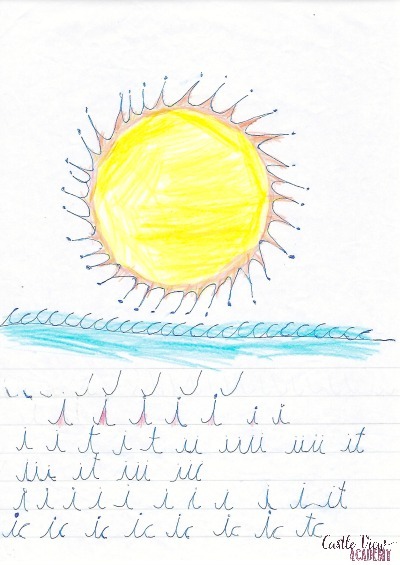 There may be some cursive practice on the lined bottom half of a page, while the blank top half is reserved for drawing. Then it gets interesting by using the target letters right within the picture such as turning the letter c into the treads of a tractor tire, or using a whole line of the letter m joined up over several rows to create ocean ripples. Other lessons may teach a little about geography or science along the way, too. Level 1: Drawn To Connections is perhaps the most elementary of the courses as there are only a few words to print; the concentration is on drawing. 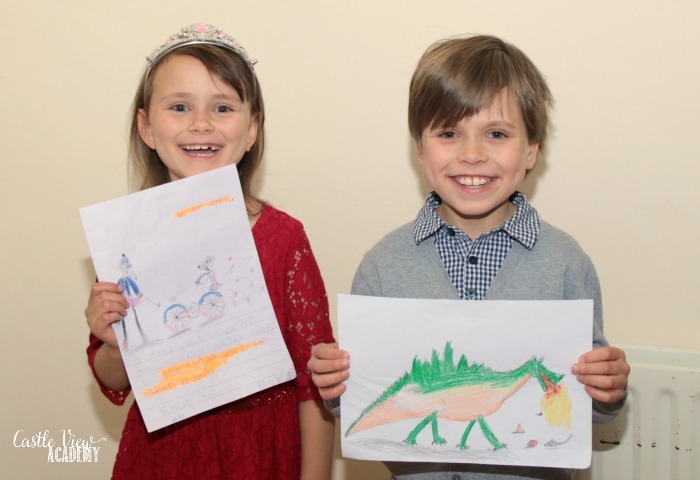 There are ten blocks in this course with each block containing several lessons from shapes to sea life to dragons; there are even a few short story books to be created. Each lesson builds off the one before but it is possible to work out of order and follow your interests. These videos are mostly about the pictures and following the instructions and techniques to form them. Children learn about using pressure to change the shade of a crayon, how to clean a crayon after it’s used over a pencil line, etc. My seven-year-old daughter enjoyed these courses more than my ten-year-old son; but it may be that some of the drawing techniques are new to her whereas with experience, older children may already have some of the knowledge or have moved beyond cute pictures. Part of this may also be that older children may feel too mature to be using crayons for colouring; I wish I had thought of it earlier and told my children they could use oil pastels for when I suggested they try that next time, my son was more enthusiastic and suggested that by using pastels he would be better able to blend the colours. There are still two additional levels to come; Level 2: Drawn To Explore, and Level 3: Drawn To Create which may be of a higher level to hold his interest more. My daughter, however, loves the little mice characters and giving them their own personalities. Of course, there are many characters in the courses to draw, but the mice seem to be a favourite. I think that we may have thought there would be a little more to this course; but if you remember that it isn’t really about science, math, and other subjects; that its main purpose is to strengthen those fine motor skills and to have a little fun with creativity, then it hits the mark. If your child is already very good with their fine motor skills and knows a little about creating art, then this program may not be the best fit for them. However, if your child is struggling to write or color, then learning to hold a crayon correctly, learning how to form lines, and then ending a lesson with a fun picture rather than just simply printing the same letters over and over again could very well appeal to them. That being said, my daughter doesn’t struggle with fine motor control; she just enjoys learning how to draw better than she does. If you’d like to know more or would like to follow Drawn to Discover, you can connect with them through their website, Facebook, Twitter, YouTube, and Instagram.